We’d love your help. 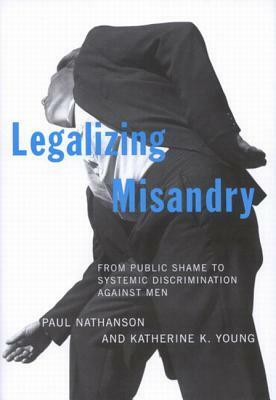 Let us know what’s wrong with this preview of Legalizing Misandry by Paul Nathanson. To ask other readers questions about Legalizing Misandry, please sign up. The simple facts that my public library couldn't locate a single copy for me to borrow [!] on interlibrary loan AND the fact that I almost died from a DVT/PE while climbing the steps to the local women's college to check their collection/borrowing-privileges should tell you enough! Get it. Read it. Feminist academics receiving immunity to criticism is the issue here but dogmatic scientism isn't really an alternative to groupthink. Science is a collective activity dealing with aggregated data, you're always going to be faced with institutional rackets. Alternative epistemologies aren't inherently bad and looking at things differently is helpful... until disingenuous statistical methods and framing of issues start affecting the legal system and cause new major social issues that can't be add Feminist academics receiving immunity to criticism is the issue here but dogmatic scientism isn't really an alternative to groupthink. Science is a collective activity dealing with aggregated data, you're always going to be faced with institutional rackets. Alternative epistemologies aren't inherently bad and looking at things differently is helpful... until disingenuous statistical methods and framing of issues start affecting the legal system and cause new major social issues that can't be addressed because of certain outdated social mores. Insisting "I'm a detached individualist and you're just an emotional ideologue" isn't really a smart way about contesting all this though. 1. They sort of fall into the same trap of "help, we're being oppressed!" as they accuse feminists of doing. Perhaps this is for good reason, as illustrated by the book. But don't be a hypocrite. 3. The authors tend to privilege religion. But, I should've read the back leaf about the authors. Professors of religion. Ah. Never mind. I would argue with the assertion in the book that religion as a force for good in the world. But look at my "author" bio and you'll see I'm an atheist of the "Hitchslap" variety. Of course I'd argue against religion as a force for good. Thoroughly enlightening and scary, further evidence that equality, in the realist terms, is all about who can be more vile to others,dogmatically;rather than building up individuals, as is professed in ideology. I came to the impression that pundits, whether MRA or Feminist, are the problem with modern equality, and villainizing is often done best by actual villians. It also seems to me that the arguments and data from this book are well received by almost any who read it, except again those wit Thoroughly enlightening and scary, further evidence that equality, in the realist terms, is all about who can be more vile to others,dogmatically;rather than building up individuals, as is professed in ideology. I came to the impression that pundits, whether MRA or Feminist, are the problem with modern equality, and villainizing is often done best by actual villians. It also seems to me that the arguments and data from this book are well received by almost any who read it, except again those with 'Motivated Reasoning'. I have heard one question repeatedly about this book from young and old, male, female, gay, ts and straight: "Why is this Data and or book not included in Gender Studies curricula and not shared by mainstream sites that perpetuate the support equality?" And for that answer, you need to read the book. The second in the misandry series focused on how legal institution is promoting misandric double standard and hypocrisy. A much better improvement from the first book with various shocking facts about the ideological feminism destroying family and lives. I read an unedited draft copy. Disturbing and provocative how insidious this is.